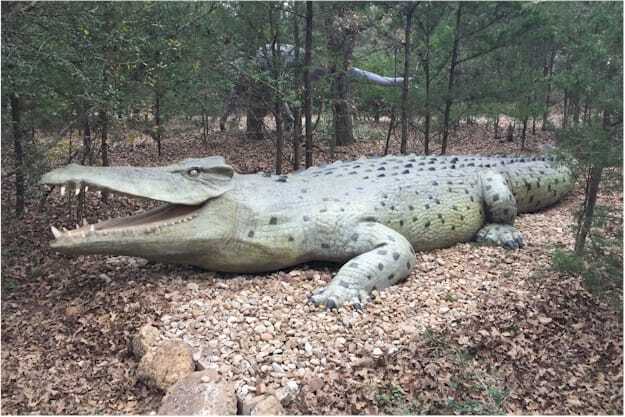 Although not technically related to modern alligators, Deinosuchus was an ancestor of the animals that would lead to the rise of the American Alligator. Though its primary diet likely consisted of mostly sea turtles, it's incredibly likely Deinosuchus ate dinosaurs on a consistent basis. In fact, Deinosuchus seems to be the only large crocodylomorph that was fine-tuned to take on dinosaurs such as hadrosaurs. There have been tooth marks in the bones of hadrosaurs that could only have come from a Deinosuchus. But all dinosaurs were seemingly on the menu, as fossils of two large carnivores --Appalachiosaurus and Albertosaurus--show evidence of Deinosuchus bite marks. Both of these predators were around thirty feet in length. Deinosuchus was long thought to have been the largest crocodilian that ever lived, though both Sarcosuchus and Purrasaurus were likely slightly larger.